SynAtomy™ muscular skull model includes all of the major skeletal, muscular, and cartilaginous structures of the skull, jaw, and oral cavity, including the soft and hard palate. Structural Features: Skeletal, muscular, fascial, and cartilaginous structures of the skull, jaw, and oral cavity. 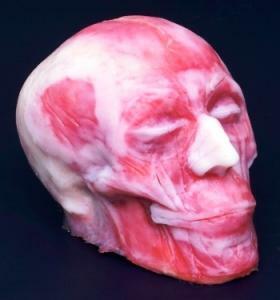 Competitive Products: 3B Scientific's Head Musculature Model. Price: $900.00 (cat № M-SKU-F-0005).